Washington Capitals forward Alex Ovechkin is closing in fast on Sergei Fedorov for the most goals scored by a Russian-born player in the NHL. Ovechkin, who has scored in five of his six games this season, needs three goals to tie Fedorov's total of 483, which he scored during an 18-year career spent mostly with the Detroit Red Wings but also featured stops with the Anaheim Ducks, Columbus Blue Jackets and the Capitals. Fedorov, who left the NHL at 39, played 1,248 NHL games. But how do these two legendary Russians compare when measured head-to-head with the various tools available through the use of analytics? By any traditional measure, Ovechkin has been scoring goals at a much faster rate than Fedorov. Goal No. 480 by Ovechkin came 35 days after his 30th birthday, which is 69 percent more than Fedorov had scored by that same age. Ovechkin reached 480 goals in 765 NHL games, an output of 40 percent more goals than Fedorov managed at the same threshold of games. Ovechkin's achievements are even more impressive when you consider that Fedorov had two key advantages in the accumulation of goals: playing for a strong offensive team in a higher-scoring era. Goals were more abundant in the 1990s than they are today, which gives Fedorov an edge. In the 1993-94 season, Fedorov scored 56 goals and there was a combined average of 6.48 goals per game. Last season, Ovechkin scored 53 goals but there were 5.46 combined goals scored per game. There were nine 50-goal scorers in 1993-94, but Ovechkin is the only player to score 50 goals in any of the past three seasons. With an adjustment for the reduced scoring in the NHL today, Ovechkin has already scored more goals than Fedorov, scoring 464 era-adjusted goals to 436 for Fedorov. In this case, era-adjusted goals were determined via a season-by-season breakdown of goals scored, dividing the goals scored by each player by the average number of goals per game for that season and then multiplying that total by the standard of roughly 5.5 goals per game, the current goals-per-game rate. Fedorov, who will be inducted into the Hockey Hall of Fame on Nov. 9, also had the advantage of playing for a dominant offensive team, where he was surrounded by a wealth of incredible scorers. The 1993-94 Red Wings had five other future Hall of Fame members, including Steve Yzerman, who was coming off a season of 58 goals and 137 points. 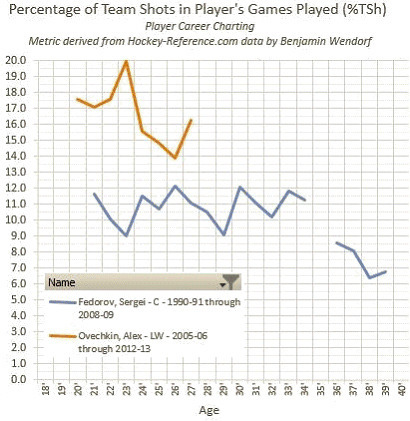 To demonstrate how Ovechkin is responsible for a far greater percentage of his team's offense than Fedorov was, consider the chart put together by Ben Wendorf of Hockey Graphs. Ovechkin (in yellow) generates between 14 and 20 percent of Washington's shots; Fedorov (in blue) was typically between 9 and 12 percent throughout his career. Ovechkin scored 475 goals before he turned 30, edging Jari Kurri for third all-time, behind Wayne Gretzky (706 goals), and Mike Bossy (554). How many more goals will Ovechkin score? As a player gets older, there's a natural decline in his ability to score goals. Fedorov, as an example, scored 52 total goals during his final four NHL seasons. Every individual player is different, but if expectations are based on the year-to-year changes of the 90 players to manage at least 50 goals at some point in their careers, then we can expect Ovechkin's scoring to drop slightly throughout his early 30s, and then far more noticeably at around age 35. This chart includes Ovechkin's actual scoring totals (in blue) and what they may be in the future (in grey), assuming he plays until age 39, like Fedorov. 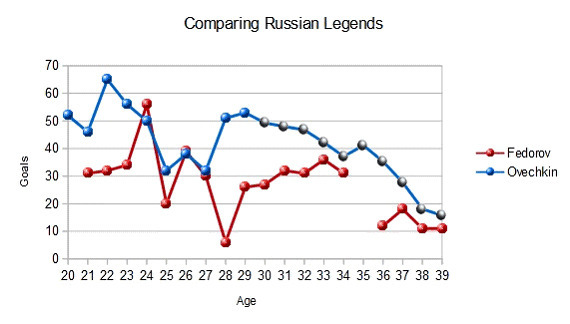 The two Russians scored at similar levels for a few years, but Ovechkin was clearly the superior goal scorer past age 27 and is projected to continue to outscore Fedorov, even with the expected decline associated with age. Assuming good health, the statistical model suggests Ovechkin could reach 836 goals by age 39, which would be second all-time to Gretzky's 894. Fedorov may have been the more complete hockey player. He drove possession, had superior assist numbers, won the Selke Trophy twice because of his elite defensive play, and won the Stanley Cup three times. When estimating a player's overall contributions using a catch-all statistic like Goals Versus Threshold (GVT), a measurement of a player's contributions in terms of goals scored or prevented above that of a replacement-level player, Fedorov remains safely ahead of Ovechkin, 255.9 goals to 206.8. When it comes to pure goal-scoring, on the other hand, Ovechkin is clearly the superior player. He has reached every goal-scoring milestone in fewer games than Fedorov, and at a younger age. He has won the Maurice Richard Trophy five times and accomplished all of it on a less-dominant offensive team in a lower-scoring era. With several more seasons as one of the top goal-scorers, it will be exciting to see how high Ovechkin can set the bar for the next superstar Russian who comes along.